Cyclists ride over the 1.6 kilometer long Bosporus Bridge, the last stopover of their ride that took them from Austria to Turkey. 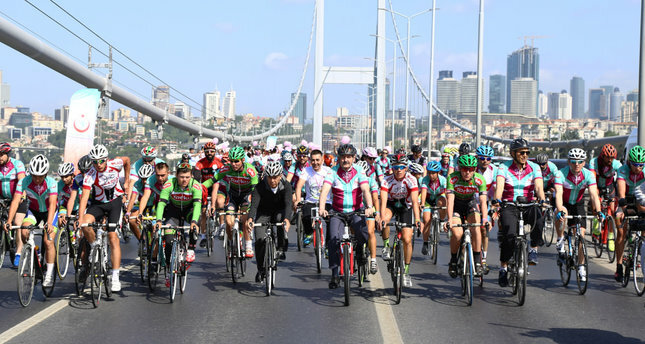 A bicycle ride that started in Vienna to raise awareness of cancers affecting women ended after riders crossed Istanbul's Bosporus Bridge Sunday. Dozens of riders from European countries were joined by Turkish cyclists and accompanied Health Minister Mehmet Müezzinoğlu on the tour's Bosporus leg. Sunday's event wrapped up the tour that started in Austria and passed through Hungary, Croatia, Serbia, Bulgaria and Greece. A group of Turkish cyclists rode from capital Ankara to Istanbul to join the cyclists from Europe. The Bosporus Bridge was illuminated in pink on Saturday night to help raise awareness as well. Jointly organized by the European Society of Gynecological Oncology (ESGO) and the Health Ministry, the "Ride 4 Women" initiative aims to raise awareness on cancers that affect women, such as breast, ovarian and cervical cancer. ESGO said 528,000 women are expected to be diagnosed with cervical cancer every year and two women in European Union countries die every hour as a result of cervical cancer. ESGO added that raising awareness is key to increasing the cancer survival rate as cervical cancer is among the most preventable and curable cancers. Speaking at the event, Müezzinoğlu said early action can prevent cancer. "We have to raise awareness among the public and educate them about how it is not that difficult to fight cancer. At least one-third of cancer cases can be prevented by individual action and another one-third can be stopped through early diagnosis. So, it is mostly a personal task. I believe women can help to better prevent cancer cases if they spearhead the awareness efforts," he said. Ride 4 Women seeks to encourage women to pursue a healthier lifestyle, a key aspect in preventing cancers that affect women. This includes managing their lifestyle, being more physically active and maintaining a balanced diet. Experts say the majority of deaths from cervical cancer stems from late diagnosis of the disease. The government endeavors to keep the public healthy with similar campaigns, urging people to ride bicycles and has distributed bicycles to students in a campaign fighting sedentary lifestyle, one of the main factors in a number of diseases and health conditions from obesity to cardiovascular diseases. Cancer is the second-leading cause of death in Turkey, according to official figures. Neoplasms, or malign precancerous tumors, claimed more than 76,000 lives last year in the country. An official for the Turkish Cancer Society recently said one-in-every-five men in Turkey will contract prostate cancer while one-in-every-eight women in the country will develop breast cancer. Müezzinoğlu said Turkey is proud of its fight against cancer, especially lung cancer linked to heavy smoking. "The cancer diagnosis rate decreased to 30,000 from 33,000, an indicator of the success of our anti-tobacco policies," he said, highlighting the country's anti-smoking campaign, including a widespread ban on smoking in public places and free treatment for smokers. "We now aim to improve our efforts for an active, healthy lifestyle and to fight obesity," he added. Experts call on authorities to take further measures to increase early cancer diagnoses. The head of the Turkish Cancer Society, Burak Duruman, said at a recent event on the issue that the lack of an early diagnosis played a role in the rise in terminal cases. He said two out of three cancer patients in Turkey die within five years of being diagnosed.